It is a traditional Mangalorean dish. Kadale means chick peas and Manoli means Ivy Gourd (kovakka/Tendley). This dish is prepared on the occasion of Marriages by Bunts. 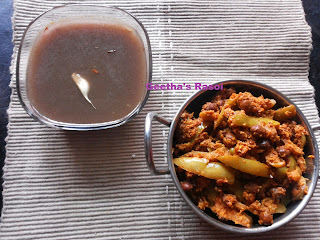 I learned this recipe from our household maid “Akku” who used to prepare it very well. Soak chickpeas overnight and pressure cook till done. Drain extra water and keep aside. (This stock can be used for making tasty rasam). Cut manoli( ivy gourd) into lengthwise, add little water and cook till done. Dry roast coriander seeds and jeera till nice aroma comes. Then grind this with grated coconut, red chilly, haldi powder into coarse paste . (do not add much water). Heat oil in kadai add mustard seeds and urad dal fry till light brown then add crushed garlic fry for a min, then add curry leaves and red chilly and then add ground coconut masala fry for 2 min to remove raw smell of masala. 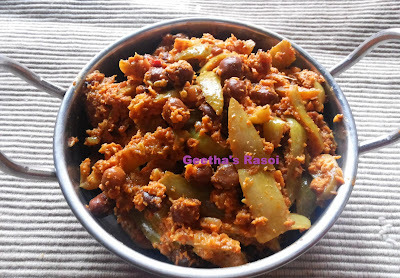 Then add cooked chickpeas and cooked ivy gourd (if it looks too dry add little water) mix well. Cook in low flame for 5 to 10 min. 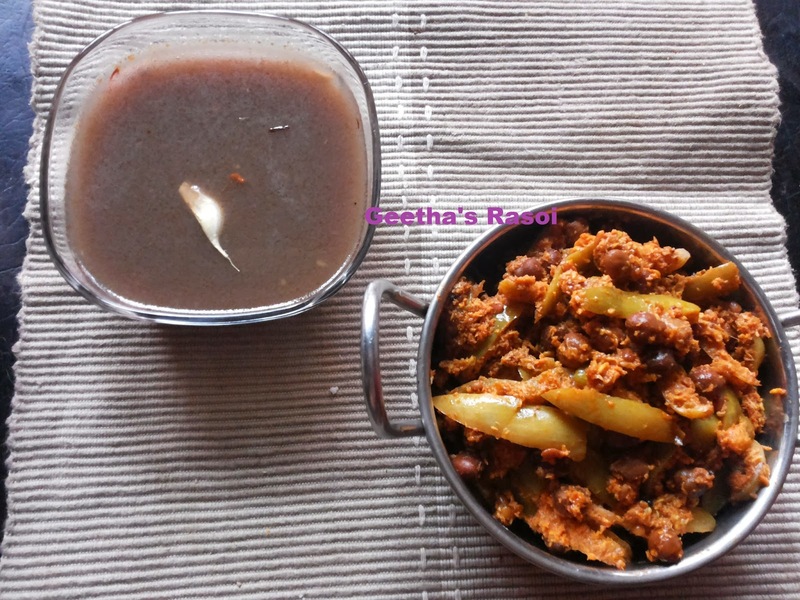 Kadale manoli ready to serve with rice and kadale stock rasam.